A basic introduction to geometry/topology, such as MAT 530 and MAT 531. Thus prior exposure to basic point set topology, homotopy, fundamental group, covering spaces is assumed, as well as some acquaintance with differentiable manifolds and maps, differential forms, the Poincaré Lemma, integration and volume on manifolds, Stokes' Theorem. We will briefly review some of this material in the first week of classes. Differential forms in algebraic topology, by Raoul Bott and Loring W. Tu, GTM 82, Springer Verlag 1982. The guiding principle of the book is to use differential forms and in fact the de Rham theory of differential forms as a prototype of all cohomology thus enabling an easier access to the machineries of algebraic topology in the realm of smooth manifolds. The material is structured around four core sections: de Rham theory, the Cech-de Rham complex, spectral sequences, and characteristic classes, and includes also some applications to homotopy theory. I will assign problems in each lecture, ranging in difficulty from routine to more challenging. There will be also a take-home midterm and a final exam. Course grades will be based on these problems (and any other participation); solving at least half of them will be considered a perfect score. KnotPlot. Download binaries from the following site. Geomview another interactive 3D viewing program. "Topology enters mathematics": a brief overview of the early developments (MacTutor History of Mathematics archive). "The Topological Zoo" at the Geometry Center: a visual dictionary of surfaces and other mathematical objects. 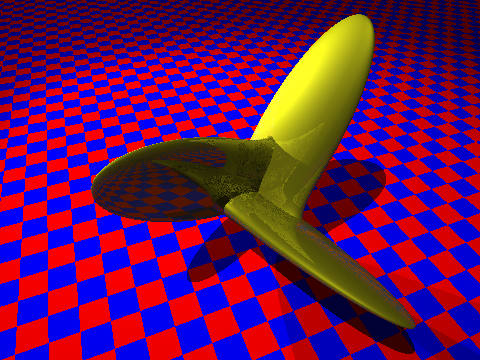 Images of "classical" topological "objects" from the Geometry Center. 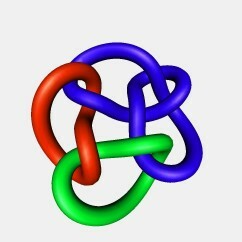 "A Knot Zoo". Here is another one. Or Hyperbolic knots. All these sites are part of an exciting collection of knots and links available at "The KnotPlot Site". Very instructive are also the VRML knot models. 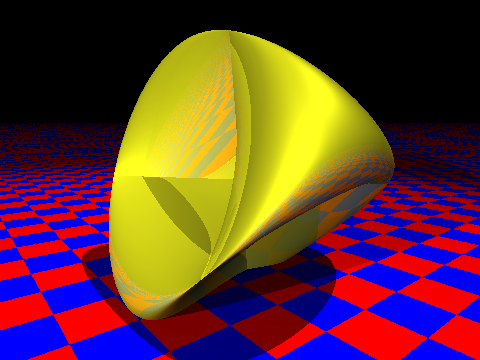 Raytraced images: Sphere, Torus, projective plane: a Crosscap, a Steiner surface, a Boy surface, and a genus 3 orientable surface. 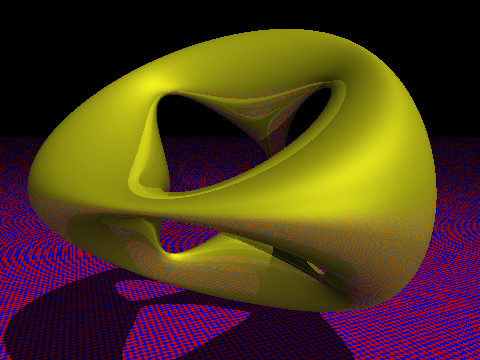 VRML models: a Möbius band, a Klein bottle and a Trefoil Knot. Download here a vrml viewer for Linux. David Eppstein's "Geometry Junkyard": a collection of pointers, clippings, research blurbs, and other stuffs related to discrete, computational geometry, and topology. 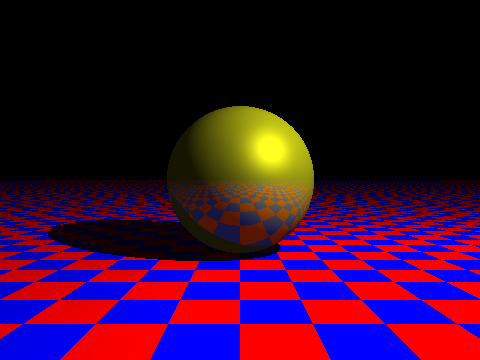 Paul Bourke's collection of raytraced surfaces. Here is for instance the animation of a transition from a Steiner surface into a Boy surface. A picture of the Hopf fibration created by Ken Shoemake. Click here for a better quality TIFF version of the picture. The picture visualizes well the remarkable geometric fact that any two fibres (=circles) of the Hopf fibration are linked. Here is another page and an mpeg animation of the Hopf fibration (created with Knotplot). More art links on Carlo H. Séquin's web site. 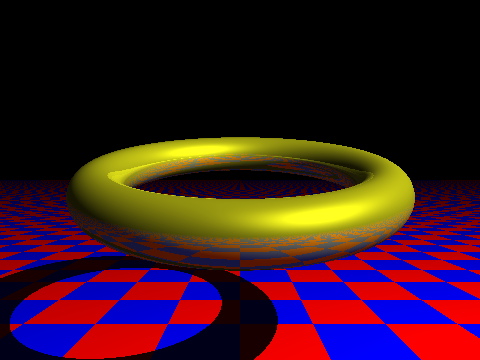 Torus and Klein Bottle Games: a collection of Java applets/games played on the surface of a torus or a Klein bottle (chess, tic-tac-toe, crossword puzzles, and more).